It may be time to leave the subject of the floods, for a while. 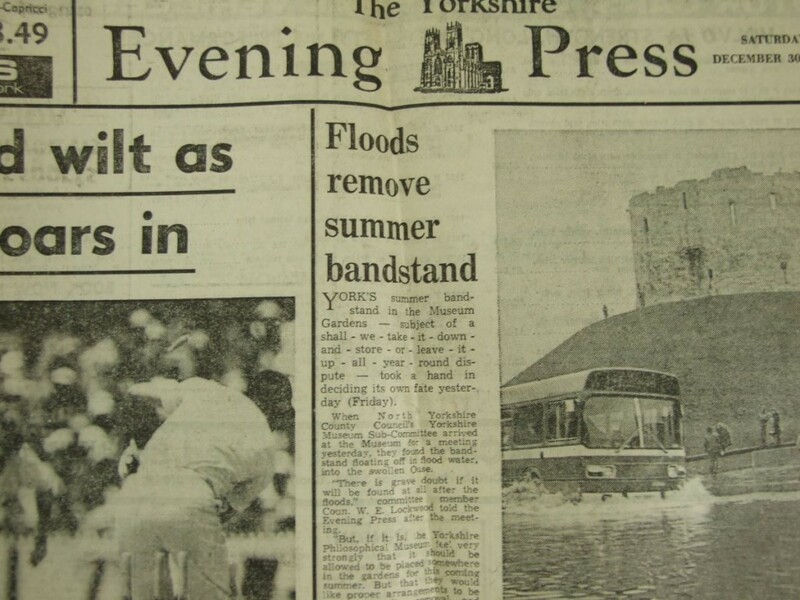 But before we do, I can’t leave the 1970s newspaper without mentioning a couple of other things reported in that edition of the Yorkshire Evening Press of 30 December 1978. York’s summer bandstand in the Museum Gardens — subject of a shall – we – take – it – down – and – store – or – leave – it – up – all – year – round dispute — took a hand in deciding its own fate yesterday (Friday). When North Yorkshire County Council’s Yorkshire Museum Sub-Committee arrived at the Museum for a meeting yesterday, they found the bandstand floating off in flood water, into the swollen Ouse. “There is grave doubt if it will be found at all after the floods,” committee member Coun. W. E. Lockwood told the Evening Press after the meeting. Mrs Mary Pierce, a museum cleaner, had struck up a rapport with the squirrels. There had been educational benefits, as Mrs Pierce had ‘laid on a squirrel performance’. Did the bandstand ever come back? If it did, was the store it/leave it out all year bandstand dispute ever resolved? Was anyone ever bitten by the squirrels? I’ll leave these questions with you, dear readers. Glad they mentioned the peacocks. You can still see one of them in the reading room of the Yorkshire Museum*. Is it a stuffed specimen? I can’t afford at present to investigate, but can offer readers a photo or two of what I think was probably one of the last of the Museum Gardens peacocks, pictured in 2004, on this page compiled in 2011.